The Ffarm offers a fantastic breakfast experience to start your day. We can provide dairy free spread, gluten free bread, gluten free sausages or soya milk with prior notice. Ffarm Country House is able to offer a fine dining experience to both guests and non-residents in our fully licensed restaurant. We can offer a wide variety of choice in your evening meal and we are happy to adapt any of our dishes to suit personal preferences – our policy is to be flexible. To help us provide the best possible quality of food and service we do need to know if dinner is required and your menu choices in advance (a minimum of 48hrs notice is requested). Please contact your hosts, Susan & Stewart to discuss reservations and your menu choices. The restaurant is available for booking most evenings from 7 pm except for our nights off on Tuesdays and Thursdays (although it is possible that the odd exception can be made for that special booking if we are able to rearrange our nights off – please call to discuss). Since we do all the catering ourselves we don’t have a large capacity in the restaurant so please contact us as early as possible to check availability. Unfortunately we can not guarantee that every booking for accommodation automatically ensures a place in the restaurant but we are happy to provide recommendations for other places to eat – and there are some exceptional restaurants in the area. The restaurant can also be booked either for exclusive dining or for private functions – again please talk to us to discuss options and availability. Please note that our policy is to limit numbers to ensure we offer the best possible service and a relaxed and uncrowded atmosphere in the dining room – we will never rush our guests to free up a table or mix private dining with functions. Because of this it is important that you check with us as to availability in the dining room as we do get booked up quite easily. All food is prepared and cooked on the premises by your hosts using the freshest local ingredients. We have tried to provide as much choice as possible but it is difficult for us if we are juggling too many different dishes in the Kitchen. This year we have therefore chosen to have two different menus available – one for Fridays and Saturdays and another for Sunday, Monday & Wednesday. You will see the most popular dishes on both menus but it has allowed us to bring back some old favourites and add some exciting new ones too. Our meals are unpretentious and our portions tend to be generous but some of our menu choices do have the option of a smaller portion for those with a smaller appetite. We trust that you will find something to your taste no matter which evening you dine with us. 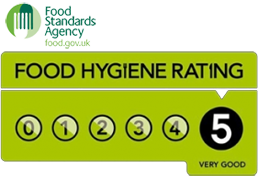 Please let us know in advance if we need to cater for any specific dietary requirements or allergies and we will be happy to discuss the ingredients and do everything we can to adapt our menu to suit (although we cannot absolutely guarantee any dish would be entirely allergen free). Our menus and wine list are here…. For Christmas parties of 8 or more persons we will create a festive menu to suit your requirements, whether that is a traditional Turkey Roast & home made Christmas pud or a special menu tailored to your individual taste – simply give us a call to discus. And to usher in 2019 we are offering a superb 8 course banquet on New Years Eve with fireworks at midnight for just £55 per person. Spaces are limited so please give us a call. The menu will be finalised during November.